Federal, state, and local emphasis on academic testing has resulted in less time and resources for school personnel to promote a positive school climate, support prosocial development and prevent harmful actions (bullying and violence) in K-12 schools. Rather than viewing students as problems to be fixed, we believe students are the solution to improve school climate. 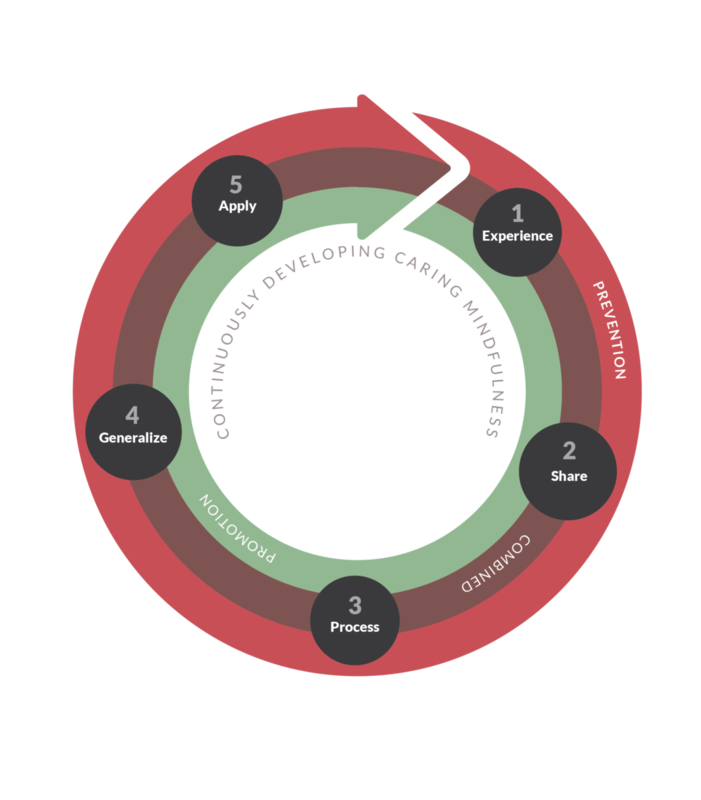 COR 4 is comprised of four approaches that aim to develop students into more caring leaders who change their surroundings through actions, consciousness, solutions, and analytics. Each COR 4 approach builds on the prior learning outcomes as participants progress through each approach, creating an integrated system of student development and school climate change. As students graduate to the next approach, they more deeply understand and apply caring behaviors to benefit their classmates and school. Actions encourage students to perform and reinforce kindness as both recipients and bystanders of caring actions. This approach focuses on changing peers’ behavior and developing positive habits. Using a research-based, goal-setting framework and an innovative triadic interaction model, students set goals, track their own progress, and see the benefits of kindness. This is “acting into thinking” versus “thinking into acting”. Based on their role either performing, receiving, or as a bystander of a caring action, students address school climate issues and attain school climate aspirations via the triadic interaction model. Students vary in caring competence for helping others. Approaching and helping a peer—who is an acquaintance—may be easy for one student, but for another student, the action may fall outside of their comfort zone. Applying concepts, such as the zone of proximal development (ZPD) and scaffolding, results in students being challenged to perform caring behaviors that are within their abilities, but are also gradually more difficult. Over time, prosocial behaviors are easily achievable and occur more frequently. The recipient of a caring action plays a pivotal role in the frequency of prosocial behaviors performed in a school. Positively reinforcing the performance of a prosocial behavior via recognition or the expression of gratitude increases the likelihood the prosocial behavior will be performed again. Similar to teachers positively reinforcing students’ academic effort with good grades, or coaches rewarding hard work at practice with more game time, Building Caring Actions has students actively reinforce caring actions performed by their peers. While a bystander is an individuals who witnesses a behavior and does not get involved, upstanders are bystanders who choose to play an active role when they witness a behavior. Building Caring Actions has students performing upstander behaviors by recognizing prosocial behaviors, intervening when harmful behaviors are being performed, or supporting victims after witnessing the performance of a harmful behavior. 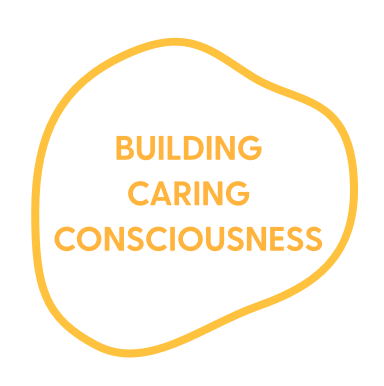 Consciousness encourages students to develop the understanding and skills to better perform and reinforce caring actions for oneself and peers. The approach provides the social-emotional skills to identify the influential factors (i.e., personality, identity, values, culture, motives) affecting themselves and their peers at school. Using an experiential learning model, students translate the aforementioned knowledge into caring actions. Participants’ individual identity (e.g., gender, race, socioeconomic class, age) influence the caring actions they feel competent to perform. The recipient (e.g., friend group member, peer acquaintance, building adult, community member, family member) of the caring action may also influence their sense of competence to perform a caring action. Their cultural context (e.g., environmental norms) also influences the behaviors they deem appropriate to perform. By increasing their awareness of how both individual identity and cultural contexts influence the caring actions they perform, participants become more mindful of how to tailor caring behaviors to individual, team, and community needs. Students address climate issues and develop their understanding and application of character strengths by participating in an adaptation of the experiential learning model, as well as integration of Cor Foundation’s Building Caring Actions program model. Program participants are introduced to the lesson plan’s character strength (i.e., courage, gratitude, recognition, understanding) and how the character strength relates to other strengths from the Cor Foundation’s Building Caring Actions model. 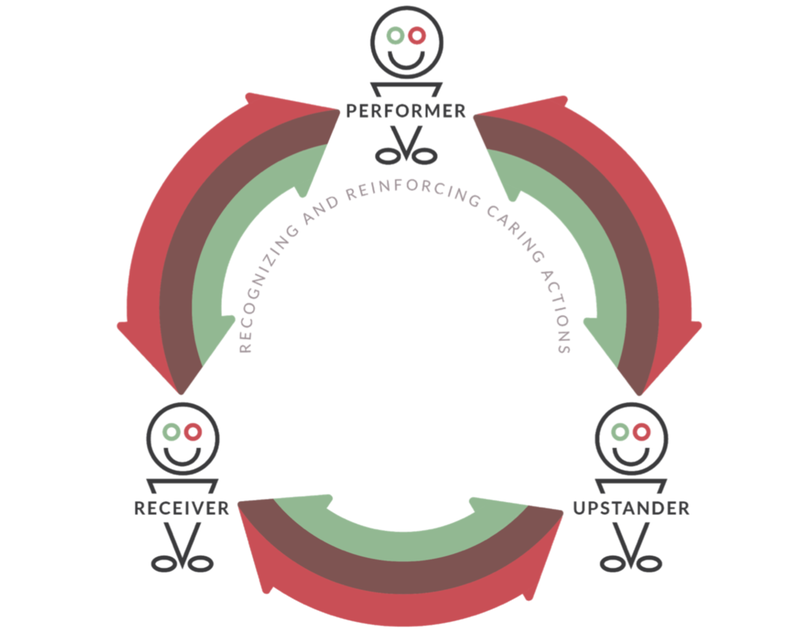 Participants develop an understanding of how the performer, receiver, and upstander of a caring action relate to the lesson’s particular character strength. During this stage, students also participate in an activity to immerse themselves in an experience related to the lesson’s character strength. Following the lesson’s character strength activity, students participate in a discussion to share with their peers their experience as either the performer, receiver, or upstander. For example, during the Courage lesson, performers will typically share if they felt discomfort, hesitance, or pride performing the courageous caring actions. Receivers will typically share positive feelings they experienced as a result of being the recipient of the courageous caring action. Upstanders frequently share their experience of observing the performance of the courageous caring action. After students hear from their peers, Character Coaches guide students through discussion questions to further reflect on their individual experiences with the lesson’s character strength. After completing personal reflections and hearing peer reflections, participants generalize their experiences with the lesson’s character strength activity to real-world applications. Character Coaches challenge participants to create examples of how the character strength can be demonstrated through behaviors in various contexts (e.g., with friends, in classrooms, and at home). Character Coaches end the lesson by giving students Character Challenges. Character Challenges are behavioral applications of the lesson’s character strength. Students are encouraged to complete their Character Challenges prior to the following lesson plan. Character Challenges are divvied up based on a particular role (i.e., performer, receiver, upstander) students might play in real life in relation to a caring action. During this stage, students are practicing the particular Character Challenge(s) they received from their Character Coaches. The Character Challenges facilitate participants’ self-confidence to perform caring actions across settings. Solutions guides teams of students through a five-step problem-solving process focused on the prevention and elimination of problems, and actualization of aspirations, in their school climate. Throughout the problem-solving process, team members apply principles of servant leadership and followership to work collaboratively and effectively in order to meet the needs of their school. The problem-solving process increases participants’ critical thinking, leadership skills, and cognitive complexity while providing communities with bottom-up solutions for improving their school’s climate. Students address school climate issues and attain school climate aspirations by following the Strategic Prevention Framework (SPF) and SARA problem-solving method. The full program model with all program components is shown below and then deconstructed with additional models and detail throughout the overview. Students identify school climate issues and climate aspirations they believe need to be addressed. Then, students identify the causal factors of school climate issues and/or for the absence of the climate aspirations. The identification of causal factors enables students to develop a more complex understanding of, and logical solutions to, the more critical factors influencing the school climate. When causal factors are not identified, participants create solutions for the symptoms of an underlying issue. Students create short-term and long-term solutions for the identified causal factors affecting school climate. These solutions are more than “brainstormed ideas”; they include timelines, logic models, milestones, specific tasks assignments for team members, and accountability processes to ensure the completion of tasks. By the end of the planning stage, participants have developed and prepared a proposal for the school administration to provide feedback, and students subsequently improve prior to implementation. Students’ solutions are “pitched” using a Shark Tank environment for school administrators (e.g., principal, superintendent) and community members (e.g., PTA President, local United Way representative) to react to their proposed solutions. Prior to presentations, participants prepare statements and arguments for which aspects of their solutions are necessary for success and areas for compromise. Students enhance their public speaking skills, but more importantly, they learn to develop more persuasive arguments to advocate for themselves and the needs of their peers. Upon receiving feedback and making improvements to their solutions, participants will have developed buy-in from stakeholders both inside and outside of their school building. Students implement their solutions after receiving administrative approval, buy-in from necessary stakeholders (i.e., teachers, influential student body members, parents), and the necessary resources are allocated for implementation. Throughout the implementation stage, participants collect feedback and outcome data related to their implemented solutions. Participants assess the impact and effectiveness of their solutions using a mixed-methods approach. Thus, during the implementation stage, participants collect data to inform stakeholders on whether or not their solutions produce desired outcomes and recommend strategies for building on their work. Analytics – High School Program guides teams of students through a 10-step research workflow to develop psychological research studies on their school climate. AP Psychology students use their course knowledge and the Analytics approach to generate research questions, develop methods, collect and analyze data for presentations of their findings at a school-based, psychological research conference. Participants learn the basics of the research process and the importance of conducting open, transparent and reproducible research based on guidelines of the Center for Open Science and the Berkeley Initiative for Transparency in the Social Sciences (BITSS) of UC Berkeley. Ultimately, students learn to work on a research team and answer research questions that are personally relevant to them to better understand themselves and their peers. Of the 14 AP Psychology course areas, none focus on the most pressing concern in psychology: the need for open, transparent, and reproducible psychological research. In order for high school students to develop an understanding and appreciation for open, reproducible, and transparent research, they must experience the process of conducting their own psychological studies. While AP Psychology course curriculum includes lecture, activities, and interactive software to prepare students for the culminating AP exam, it does not offer a problem or project-based learning method for students to develop research questions nor apply psychological science to their own lives and school problems. The Analytics – High School Program empowers teams of students to develop their own psychological research projects using a 10-step research flow process adapted from the Center for Open Science’s research workflow model (cos.io). The program model is deconstructed with additional models and detail throughout the overview. The Analytics – High School Program course presents psychological research studies on the topics relevant to the community needs (e.g., character, dishonesty, mental health, school climate, and technology). The aforementioned topics are discussed with students because they have implications on high school students’ success both academically and in their lives outside of the classroom. Students are also exposed to the topic of cognitive diversity. Topics areas, such as thinking preferences and behavioral attributes, are discussed in both personal and team contexts. Students’ cognitive diversity serves as the foundation for team cohesion and collaboration while students complete all steps in the psychological research workflow. Students use the world café model as the process to capture the class’ collective view of the research interests. During the world café process, students list their elements of interest related to a research topic (e.g., elements of character or mental health of interest), analyze causal factors related to the elements of interest, and potential consequences of the causal factors. Students then identify causal lines between the causal factors, elements of interest, and consequences. This logical flow enables students to create their own scientific theory and research questions for their study. Goals: Identify elements of interest, causal factors, and consequences of constructs. Identify scientific theory and research questions. Students learn about measurement, including levels, philosophy, and strategies for measuring concepts. The more abstract levels of measurement (e.g., self-report measures) are discussed in detail along with the difference between categorical and dimensional approaches to measurement. Students also discuss potential independent and dependent variables to measure in their studies. Goals: Articulate pros and cons of various construct measurement. Identify dependent and independent variables for research study. Identify level of analysis for research study. Based on a team’s research question, students use various sources (e.g., OSF website, Google Scholar, online databases) to identify the measures needed for their research studies. Students also download software (e.g., JASP) to conduct analyses on their research data. Students prepare their survey instruments for dissemination. Once students determine their survey is prepared, team members pilot test their survey to ensure proper data collection and problem solve any issues/bugs. Teams disseminate their research surveys via a Google Form link for their peers (e.g., AP psych classmates or select students from the school), who have completed parental consent and student assent forms. Goals: Learn how to develop a valid survey and data collection tool. Students store data in a shared folder for team-based project work and will share on open platforms for possible replication by students from other schools. With survey data collected and stored, students learn to use the JASP software to conduct research analyses. With the support of the instructor, students make any adjustments needed to their data (e.g., converting reverse-coded survey questions to useful form) and run analyses based on the theory and research questions established during the Design a Study stage. Goals: Conduct analyses using the open-source JASP software. Students use their analyzed data and their understanding of psychological research from the AP course to make inferences from their findings. Findings may result in discussion points, areas of needed research, recommendations for administrators, and limitations of their research study. Goals: Meaning-making of research findings, integration of prior AP course material with their studies. Students create research posters that are a culmination of the previous eight steps of the psychological research workflow. Students write an Introduction and Statement of the Problem related to their particular research study. They also include a synopsis of the research methodology used to collect and run analyses. Students present their data analyses in either tables or graphs. Finally, students present their interpretations of the findings, limitations of their research, and any areas of further-needed research. Goals: Summarizing the research process. Research teams prepare to present their research poster to a panel of judges. Posters are presented in poster presentation format, similar to conferences or research fairs. Judges listen to each research team present their research questions, measures, methodology, analyses, and interpretation of findings. Judges provide students with a score based on the study’s alignment with the reproducible research principles (i.e., open, reproducible, and transparent). Students presented their posters at a psychological research fair to "judges" who were psychologists, educators and community members. One team of students asked the research question: How does school-related stress impact relationship quality and self-esteem? Research studies were conducted ethically with transparency and reproducibility. These practices were built into the course design. However, some transparent practices were optional. Badges were used as incentives for researchers to engage in transparent research practices, such as pre-registration of a study along with sharing of data and materials in a public repository/website (osf.io). Want to create research-based change with us? Are you a university professor, a post-doc, a graduate student, or high school AP psychology who is interested in delivering this course in May 2019? Not sure yet? Email us and we can work with you! Can college students and community members provide capacity for public education? Administrators, teachers and support staff are often overworked with limited time and resources to implement research-informed and evidence-based programming. Our programs build school and community capacity by training adult allies and college Fellows as implementers.